What happens if I type here? 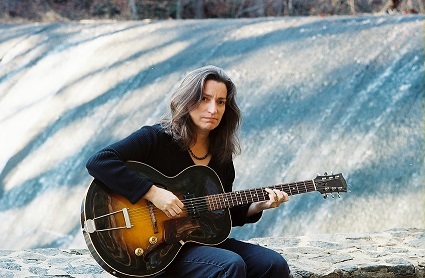 Gina DeSimone performs Piedmont and Delta Blues from the American songbook, and writes toe-tapping songs that blend in with the likes of fingerpicking stylists Elizabeth Cotton, Memphis Minnie, Del Rey and Mary Flower. Other blues artists may cover a few of the same old songs, but Gina uncovers gems from the 20s to present day and holds them up to the light for all to remember or discover. Equally comfortable on guitar and ukulele, her understated stage presence belies a soulful, gritty edge that has brought her much admiration among fans and peers. Based in Silver Spring, Maryland, Gina has been an influence and mentor for aspiring blues fingerpickers at The Archie Edwards Blues Heritage Foundation.